CyanogenMod is now Lineage OS. As you all know that Cyanogen Inc is closed and we had no idea of what would be the future for the same, but now we have the complete game plan. Read on. 1 What happened to CyanogenMod and what is Lineage OS? 2 How the CyanogenMod will effect you and what will happen to the CyanogenMod ROMS ? What happened to CyanogenMod and what is Lineage OS? As days pass on and we move closer to the end date of Cyanogen Inc shutdown, we have more clarity about the complete story of CyanogenMod. I said CyanogenMod because CyanogenMod is the only thing that stays behind after closure of Cyanogen Inc. Earlier we said that Cyanogen Inc shuts down but CyanogenMod will live, but the first statement of this post says that CyanogenMod is now LineageOS and hence it is clear that it will definitely be no more in picture. Yes it’s completely true that CyanogenMod dies too with Cyanogen Inc but simultaneously it will live in the name of LineageOS. Yes, that’s true. All current CyanogenMod codebase snapshot will be renamed to Lineage OS and development on CyanogenMod will eventually be stopped (at least core developers won’t contribute here) and developers will be contributing towards Lineage OS ROMs. How the CyanogenMod will effect you and what will happen to the CyanogenMod ROMS ? 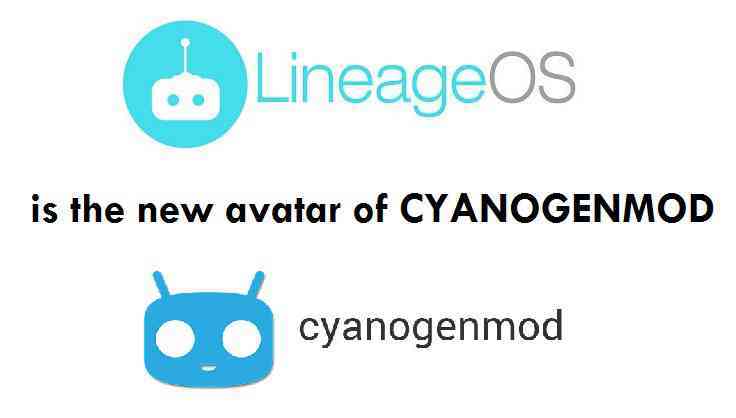 Recently a blog post on CyanogenMod that clearly concluded that it is risky to continue as CyanogenMod and hence a new name for the Open Source development is necessary and then it evolved as Lineage OS. After that blog post the cyanogenmod domain name DNS were taken down because now the authority belongs to Cyanogen Inc investor(s). AS part of the DNS take down, the Official CyanogenMod builds are no more accessible, Gerrit code review is no more accessible and hence no more code checkin. But the CyanogenMod code is hosted in GitHub and the code still stays as it is. No one can take that down unless GitHub itself shuts down. Even now you can checkout the code and build it for a device. UNOFFICIAL CyanogenMod 14 ROMs, CyanogenMod 13 ROMs will live long but the OFFICIAL CyanogenMod updates will be no more. Also, there will be no further CyanogenMod 15 with respect to an Android O release. But as a user you will be not losing anything because for us only the name changes from CyanogenMod to Lineage OS and everything stays just as it is. Take my words and stay tuned to the Lineage OS ROMs to get all Lineage OS ROM updates. Convey your thoughts in the comment box on this CyanogenMod to Lineage OS transition.